My brother is in the process of converting my father's enormous collection of slides into a digital photo library for us to enjoy. In a recent batch he shared with me, I spied these from a trip that we took as a family when we were about the same age as our kids are now. I remember a bit of my parents' planning for this trip. It included obtaining the AAA road trip and guide books to Washington, DC and plotting a route we would drive and hotels we would stay in while there. And also, I remember that it was a very big deal that both my brother and I got our own cameras to take our own pictures with while there. 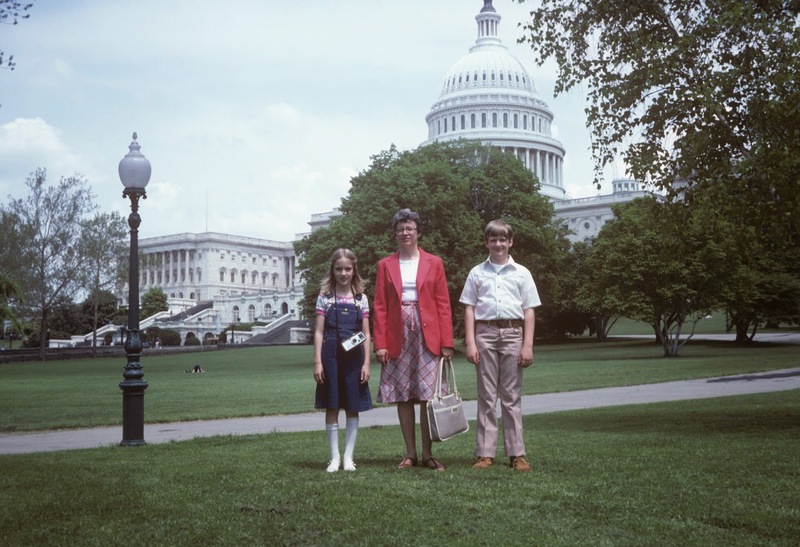 My brother had a small and newish camera, and my mother dug around the bottom drawer of the secretary and pulled out her own childhood Brownie camera. I was delighted. We went to my father's favorite camera shop where everyone knew him by his first name, (remember those? ), and stood at the glass counter and looked at the artfully displayed different kinds of Kodak film, and found the correct kind of film for my even-then vintage camera, my brother's inexpensive but modern camera, and my father's fancier camera as well. I adjusted the strap of my Brownie to be shorter and to feel just right for my height. Packed my film into my small and rolling flower powered suitcase, and apparently thought quite carefully about knee socks. I remember that when we returned from the trip, my father helped me remove the film from the Brownie, cranking it by hand to roll it back into its canister, and took the film back to the camera shop. And once my packet of pictures was developed, I put together a small photo book of my photos and took them to school to share. This past week, our family took a road trip to Washington DC. Our first day there, we went to the Mall. 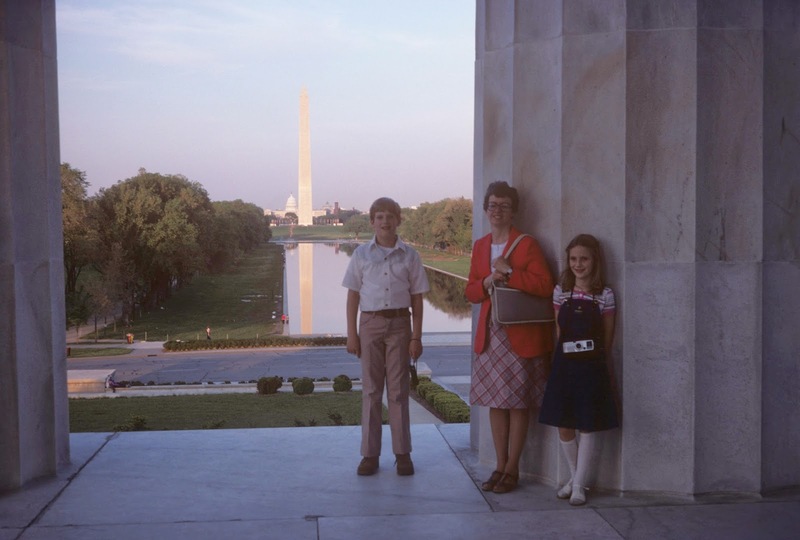 And hit all of the same places -- monuments, buildings, and reflecting pools, because that's what one does in DC -- that we had hit when I was a child. There were new monuments that were not here when I visited as a child like the beautiful World War II Memorial. And I started the day taking many of the same pictures that my father did of us in front of each one. But I was aware, as I did so, of how pictures, and access to technology have changed so very much ( I know...duh...) since I was there. It got me to thinking. As I saw each of the buildings and monuments, I did try to get some beautiful shots. And I did get some. But really, I actually stopped trying to get them. Because I knew that within seconds, I could Google a photo that was far better, or with a better vantage point, or with fewer people running in front of my camera, or with the light or the weather just a bit better. But what I can't Google is pictures of my kids doing their thing at these well documented places. I can't Google how each of them would experience this place that so many visit, what captures each of their attentions, how they work their own minds around what they are seeing. And so, I took my camera off my own neck. And passed it to Julia. And handed my cell phone with its pretty good camera to Elliott. Nicholas had his iPod with its camera with him. And I let them document our trip. When I was allowed to hold the camera at moments, I found myself taking pictures of what they were doing with their cameras, or what they were looking at and interacting with, standing behind them, trying to see what they were seeing and thinking about how they were documenting the trip. What they found interesting, important, and what they wanted to remember. And how they wanted to share it. And I found, through watching them, that though there may be different things packed into their traveling bags, and though there may be different devices in their hands, and though communication with friends is different now, this family trip was a good one, and in fact, not all that different from the one I took as a child. And with Nicholas, who now has some supervised access to a bit of connection with friends on his iPod, I watched which photos he shared, what he wrote in short blurbs to his friends about what we were doing, what -- in his mind -- justified sharing with them, and what was just for him and us. trying to get the whole thing in his picture. Washington DC seen this way, through the lens of my children, was a different place. And very cool. Julia, fresh off completing her independent research project on Sputnik, got to see a life sized version of it. We learned a bit about the American reaction to Sputnik, the fear that many experienced in reaction to its launching and orbit. The lens with which the Russia's success in the Space Race was viewed. It is difficult, sometimes, as a parent, to not see the differences between our own childhood, our own values or beliefs, and that of our children's world as negative, to be a bit afraid of how it is different and whether it is possibly damaging or taking away what we value most. But as I watched them, watched what they were drawn to, watched what they took in from each place we visited, I was comforted. They were just as likely to play and be kind despite the changes around them. Elliott found the Duck Ramp in the Sculpture Garden the most interesting feat of architecture on the Mall. And he giggled about the seemingly very confused sparrow who tried to use it. He spent time taking pictures of a fountain, and we lingered long enough to figure out that the fountain's sprayers were changing and followed a pattern of shapes. While he did this Julia captured things that amused her. In the Natural History Museum, Julia wanted to read the information plaques to Elliott. And Elliott photographed every animal in the Hall of Mammals. They were still amazed by rocks in technicolor. And Nicholas, knowing his brother's mind, went to work, trying to make sure he had back up pictures for anything Elliott missed. Surely Elliott would be devastated if any of his own pictures did not come out well. And then, during a fabulous short video in the back of the Hall of Mammals about evolution, for us, the evolution of childhood came into focus. Nicholas Instagrammed a selfie. With a bronze monkey. Later that night, after short legs had become exhausted, and some down time was required in the hotel room and pool, we did something that I am sure I did not do as a child. I downloaded a National Mall app onto my cell phone and the kids got into their pajamas and we loaded into the Subaru. And with Jonathan at the wheel and me with my iPhone, we drove around on an app-guided tour in the fading light. The city was eerily quiet, and few cars were driving the busy streets we had walked earlier in the day. And we were able to drive right up next to several of the buildings and roll down the windows and allow the kids to snap pictures of some of the places we had not gotten to by foot. Once it was dark, our pictures became more impressionistic. At one point my app and Jonathan's memory of the city from one summer there as an intern years ago both failed us. 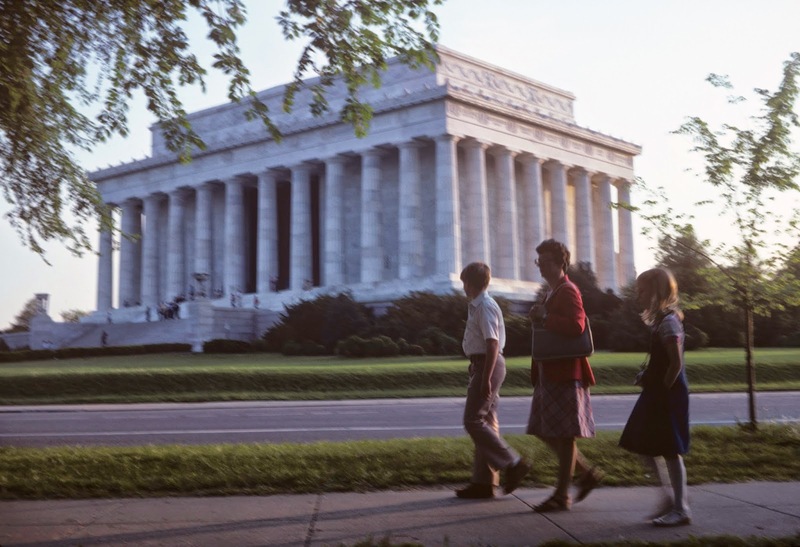 And we drove in circles around the Lincoln Memorial for about 20 minutes, trying different ways of getting off its circle, across the Potomac and back to our hotel. The kids started giggling in the back seat as we circled and circled, the Washington Monument appearing again and again. Julia started counting how many times we passed a certain set of stairs and soon lost count as we all laughed. And joked. And the kids started poking fun at those silly grownups, lost and befuddled despite having a mAp(p), guiding ourselves by the well lit and remerging Washington Monument, in the front seat. It was a good family trip. Just like mine was when I was 10. And I thought, you know, I think I like what they are seeing. Through their own lenses. And how they are using them. What they think is important. And what, with all the information out there, all the information that a major tourist destination like this lays before them, they are drawn to. They are still children. Still wondering what to pack, still delighted with a special item that they get to use for a family trip, still creating memories and stories together, and still wanting to share a bit of what they saw with their friends. But also, to keep a good bit just for us to remember and enjoy.